Old Guard Gaming : The Incomparable Dejah Thoris! Cool Stuff, Thanks for posting this! You're welcome, Al! I've built up a folder of sword and planet related art as inspirational material since I've been working on an OSRIC based rules expansion just for Flash Gordon/John Carter style play. I'll post more such stuff in the future. 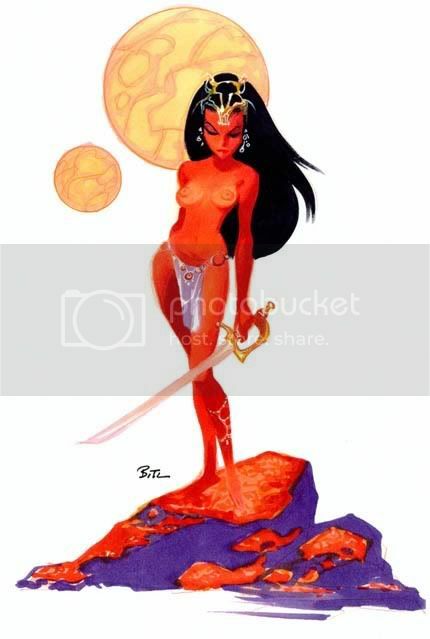 Neat art, didn't know there was much Barsoom art out there. I'd love to get involved in playing on Barsoom. Has someone already put together a rules set/adaptation for that? Well met, Baron Greystone, Dejah Thoris is a subject for a surprising number of artists out there. She and John Carter seem to be often requested as subjects for art at comic cons and commissions. I love to trawl the net for Barsoomian art and related sword & planet stuff. http://www.comicartfans.com/ This is a site that has an enormous amount of comic book,and other art. You can put just about any character or artist in the search bar and get hundreds of images. Check it out! Prepare to be horrified fellow sword and planet fans by the anaemic and whiny rendition of the alien princess soon to hit the big screens.